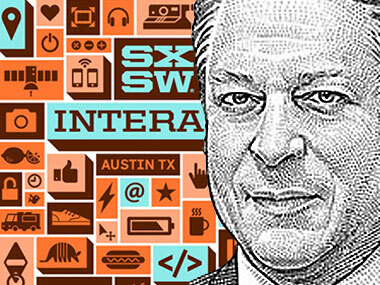 Former Vice President Al Gore took to the stage at the SXSW interactive festival today to tell a packed auditorium at the Austin Convention Center about the future. Among these drivers are — no surprise for him — severe environmental damage, as well as overpopulation and changes in biology via technology, and all the problems that come with that. Among the other critical issues, Gore also noted money politics, the ever-more-sophisticated antibiotics for livestock, and the reliance on supercomputers for stock market trading. But, in all, it’s a pretty depressing picture overall that he is painting, despite pointing out that knowing you have a problem is the first step. Which is right before Gore started reeling off the problematic pressure that money has put on politics. “Our democracy has been hacked,” he said. For example: “The NRA is a fraud,” about the National Rifle Association and its links to gun manufacturers. “I wish I could get you to be more outspoken,” joked Mossberg. “Timidity has always been an issue with me,” joshed Gore back. Gore, who often likes to talk in full and very extended paragraphs, slowly worked through the rest of the list, before he got to the issue of spider goats. 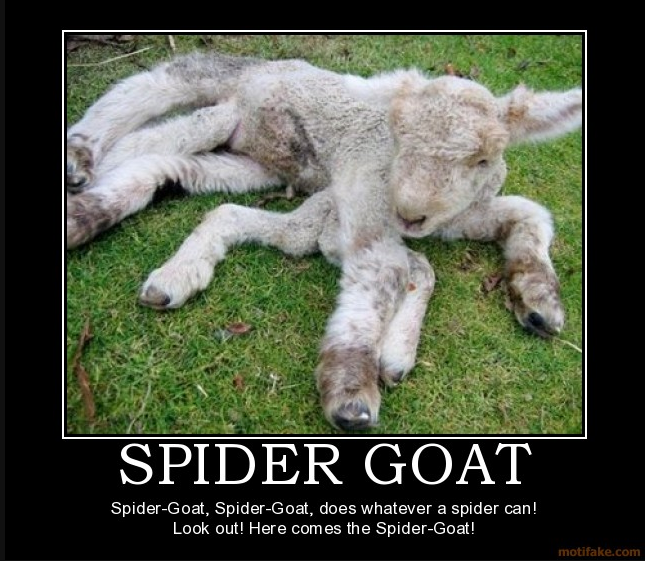 Indeed, spider goats, which are created using genetics to mix the genes of spiders and goats. Still, Gore added that there are “blessings” that come with genetic engineering, including the elimination of a range of devastating diseases. Gore soon moved onto the issue for which he is best known — global warming — after his movie “An Inconvenient Truth” gained worldwide attention. But Mossberg and Gore soon parried over the sale of Gore’s media company, Current, to Al Jazeera. This meant war, since this site is owned by News Corp. “Last I checked, he’s not in the oil business,” countered Mossberg. 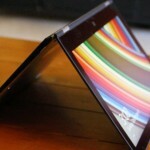 “He’s also not strictly in the news business, either,” said Gore. Oh dear, time to get back to global warming, because it’s getting hot in here. It was then onto a short Q&A, with one question about the Internet — an issue near and dear to Gore’s heart. In truth, despite all the jokes, he was critical when a senator to turning the Internet over to the people, from its origins as a government project.